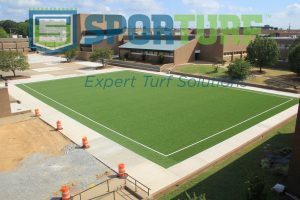 Midwest Synthetic Turf Professionals was hired as part of a large construction project on the campus of North Little Rock Middle School. Part of the project converted a courtyard area to a “zero maintenance” area that would be used for sports and events. In addition to the FastGrass AT740 play field in the courtyard, the school added several concrete basketball courts to round out the project. Midwest Synthetic Turf Professionals LLC was created by Craig Shonk to bring together ISO 9001 synthetic turf manufacturers and an ASBA Certified Field Builder for Synthetic turf fields to better serve clients throughout the Midwest. Shonk oversaw his first synthetic turf field project in 2005. That experience triggered his interest in the synthetic turf industry. Prior to being the Owner/General Manager of Midwest Synthetic Turf Professionals LLC, he was the Manager of Sporturf™ Midwest. Craig has been very involved in the product development and installation of synthetic turf fields here in the Midwest. Craig uses his diverse involvement in the synthetic turf industry to further his expertise in the Midwest Synthetic Turf market. Craig has excelled in increasing market share and brand awareness for Sporturf™ while using his turf manufacturing expertise and installation expertise to create the best experience for his clients. Craig has personally been involved with and completed over 80 synthetic turf projects in the Midwest. He is also an ASBA Certified Field Builder for Synthetic turf fields.